Midfielder James Berrett has joined FC Halifax Town ahead of their game at Boreham Wood. 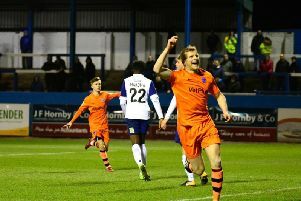 Berrett was at Huddersfield Town as a youngster with fellow Town players Nathan Clarke and Joe Skarz, and was at Grimsby last season with Clarke. Berrett has also played for Carlisle, York and Yeovil, and has played for Ireland under 21’s.